Great job. Love the form of the cherries, and the blue background is gorgeous. HI Mary Anne, Thanks so much for visiting my blog! Of course I had to see your blog, too! What a treat! Your work is beautiful, and so much fun to see! I'll look forward to more! 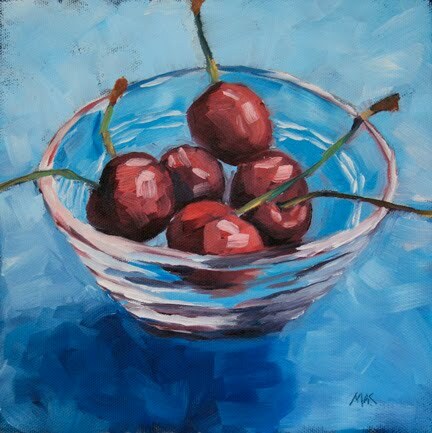 Your blue background is just perfect for this bowl of cherries - this is a wonderful, fresh painting! If you are interested in purchasing artwork or have any questions regarding price, please contact me via email. Welcome, my name is Mary Anne Cary. I presently live in Cape Elizabeth, Maine, a small town just outside of Portland that sits abutting the frigid North Atlantic. A former graphic artist, I have been interested in art throughout my life and I am excited to finally step into the world of blogging as a way of broadening my horizons. My history as an artist has gone through many phases, I have experimented with many mediums and most recently have concentrated on oils and pastels. I particularly enjoy painting landscapes and still-life, but find it fascinating to work abstractly as well. I have been inspired by all the daily painters and look forward to the growth each one expresses from working daily. Please do not hesitate to contact me if you have any questions about my artwork, pricing or if you are interested in purchasing anything you see. Additionally, you may visit my website to see more oil and pastels pieces.